CONYERS, Ga. -- William and Sharon Johnson have been living out of their car in Conyers since their landlord raised their rent. They could not afford the increase on their fixed income of Social Security, according to William. 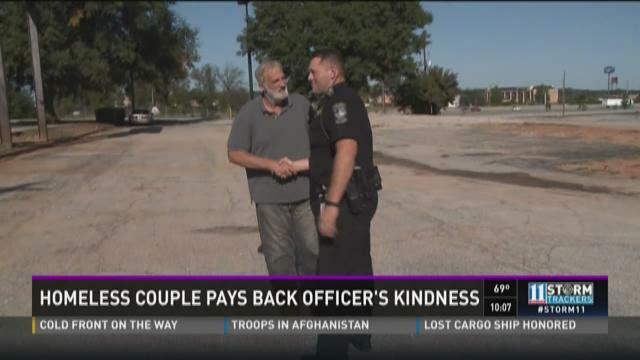 The recently found a Guardian Angel after a chance encounter with a Conyers Police officer. The Williams' have been living in thier 2004 Buick Park Avenue, parked under a tree in a secluded corner of an empty shopping center off Highway 138. Their chance encounter with Conyers Police Officer Chris Burns happened on September 27, 2015. "I was just riding through the parking lot and I noticed a car up under the trees and I came up behind it just to check on who was in the car," Officer Burns said. Inside the car, the Johnson's were playing cards, as they do so many times to pass the time. "He cam up to the window and said 'what are you doing?" William Johnson said. "I said I'm getting beat." Homelessness has not taken away his sense of humor. Johnson told Officer Burns he and his wife were waiting for the first of the month for a check to come in the mail. Sharon Johnson told the officer she would just love a cup of coffee. As Officer Burns drove away, he said he started thinking about his grandparents. "My grandparents went through a lot of hardships later in their life," he said. Burns drove to a nearby ATM and withdrew $60 to give to the couple. "I brought him $60 and my business card and I told him don't worry about paying me back," Officer Burns said. "If you need anything or you see anything, here's my card, call us." "He came back, stuck that (money) through the window," Johnson said. "I said thank you but I am going to get this back to you." After the first of the month Officer Burns said he found an envelope in his mail box at the Conyers Police Department. 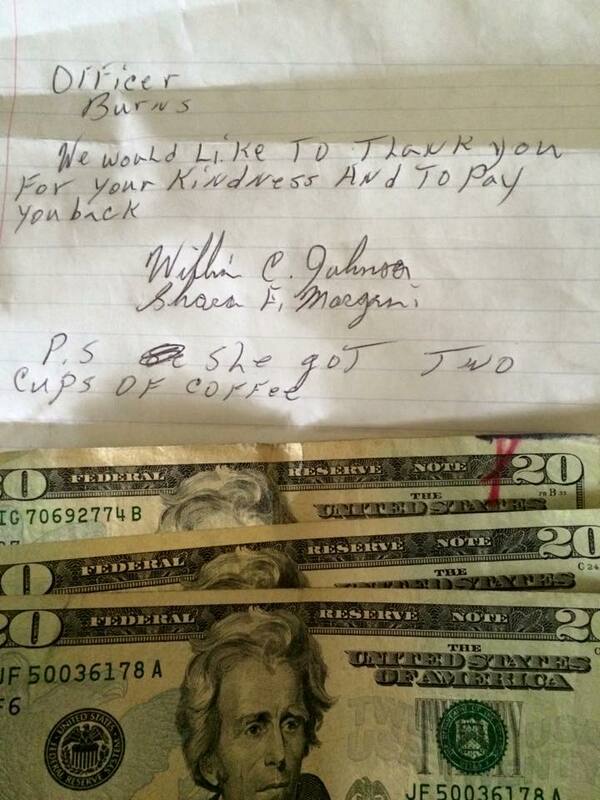 Inside the envelope was a note that read "We would like to thank you for your kindness and to pay you back." It was from the Johnsons. It had a P.S. : "She got two cups of coffee." Also in the envelope was $60. "I was like 'that's pretty cool,'" Burns said. "That he would go out of his way to repay me for just doing something to help him." Johnson said he knew he didn't have to pay Officer Burns back. "But he didn't have to do what he did either," he said. Officer Burns posted what happened on the Conyers Police Department's Facebook page and it blew up with nearly 3,000 likes and hundreds of comments. "With everything we're going through right now, to have something like that and to read all those comments, it's worth more than the $60 itself," Burns said. William and Sharon Johnson are trying to find a place to live that fits their tight budget. But until then, they will stay in their car in the parking lot in Conyers, watched over by Officer Burns and the Conyers Police Department.